Olivia "Liv" Leigh was going undercover. She needed to find out if her fiance, Geoff, was cheating on her. She wasn't certain, but there seemed to be a trail of evidence proving that he wasn't the perfect man she had thought. Unfortunately, trying to be an investigator was more difficult than Liv had imagined. First she was attacked by a door, and then she was helped into the absolutely messiest apartment she had ever seen. The good news was that Mike, whose apartment she was in, thought that she was down on her luck and offered to hire her to clean his apartment, and he lived next to Daisy, who she suspected Geoff was cheating on her with. The bad news was that the more Liv was with Mike, she worried that even if Geoff was innocent, she no longer was. For Liv was beginning to realize that the life she was living was the life her father and Geoff thought she should live. It was a life with Mike that she would want to have. But if Mike were to learn the truth of who she was, and how she had used his trust, would he still be interested? 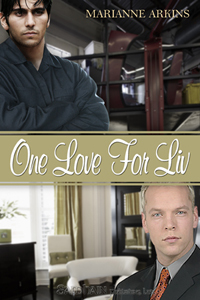 One Love For Liv was an enjoyable romance of a heroine completely out of her element, and a hero who is, at heart, a hero. Liv has absolutely no concept of how to perform the job assignments she received from Mike, so she has ingenious alternatives - primarily to have others do it for her. I particularly loved when she went grocery shopping. Mike knows that it is risky to trust a stranger, but he can't not help someone in need. It is just an innate reaction, just as he kept the ferret that was left in his apartment, and brings leftovers for the local stray dog. I simply adored Mike.